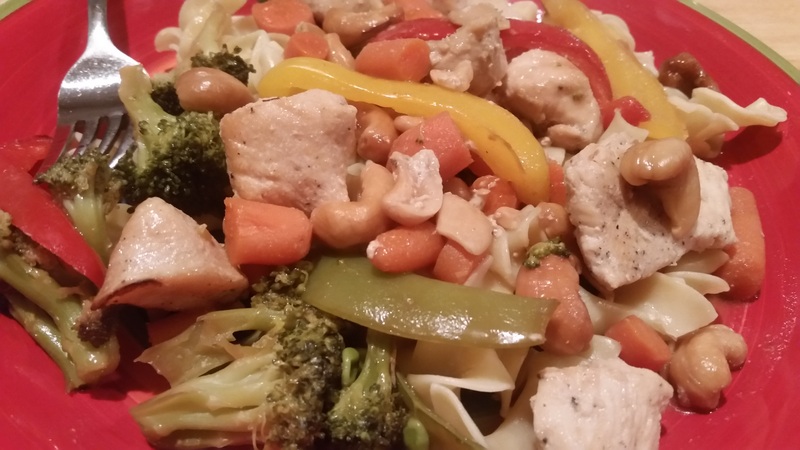 One Pan Cashew Chicken Plus – What's for Dinner Moms? We had quite a few vegetables leftover from our event the night before so we decided to use some of them in a Cashew Chicken Plus meal. We love Cashew Chicken but it normally has just a bit of broccoli and a few red pepper strips in it. We decided we were adding carrots, pea pods and some onions too to bulk it up a bit. I love sheet pan meals. If you want to double this use two pans and switch them halfway through baking do not try to crowd it all on one tray or it won’t bake evenly. Also, all except your most delicate veggies can be cut a day or two ahead of time and stored in your refrigerator to have ready for this quick easy meal! This was super yummy. We served it over egg noodles because I was all out of rice but it was nice and made the dish a bit different for the kids who are not big fans of rice anyway. TIP: If you are using carrots you will want to parboil them for about 5-7 minutes before adding them to your sheet pan otherwise they will not cook enough. Also, I like my broccoli cooked a bit more than most people so I steamed it with the carrots for about 3-4 minutes just to soften it a bit. If you like your broccoli with a slight snap you can skip this. In a saucepan over medium heat, stir together soy sauce, hoisin sauce, vinegar, honey, sesame oil, garlic, ginger, cornstarch and chicken stock until combined. Bring to a simmer, stirring frequently, until sauce thickens and bubbles. Remove from heat and set aside. Preheat oven to 400°F. Line a large sheet pan with parchment paper or foil coated with cooking spray. Season chicken with salt and black pepper then drizzle spoonfuls of sauce over the chicken coating both sides. Reserve at least half of the sauce for vegetables. Bake chicken for 8-10 minutes then remove the pan. Arrange the broccoli florets, bell peppers and cashews around the chicken. Sprinkle with salt and pepper and drizzle spoonfuls of the sauce. Stir until all is coated. Bake for 8-12 minutes, or until the chicken is cooked through. Remove pan from oven and drizzle with remaining sauce. Serve over noodle, rice, or quinoa. This is a very nice looking meal, Marci. I shall try this will rice as I don’t like noodles. Sounds great! My kids are the opposite. They don’t care for rice as much. The noodles definitely would add a different twist instead of the rice. Looks very tasty! Thank you so very much Sylvester! Great idea with leftover veggies! Thank you! I had plenty of leftovers too.